This cape covers the scooter and you, keeping you completely dry! 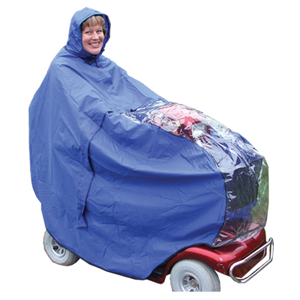 This cape covers the scooter and you, keeping the rain and wind off and providing a completely dry enivironment for you and the controls. The snug fitting pack away hood insures your only exposed part has maximum protection. It comes in one universal size which is suitable for most 3 or 4 wheeled scooters.